While most digital sponsorships are on target demographically, few check the often ambiguous "fit" component that's been discussed here in past blog posts. Raise a glass to one that does. 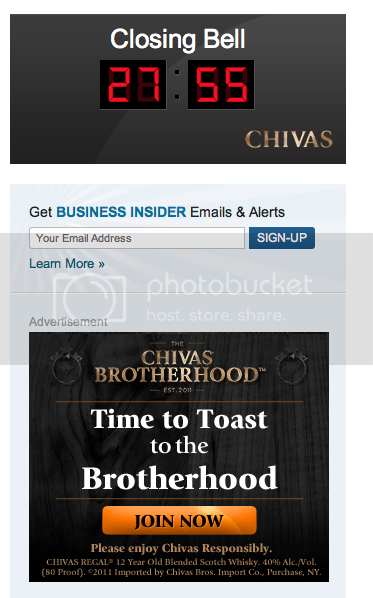 Business Insider's new sponsor, Chivas, has co-branded the Business Insider Closing Bell, a minute-by-minute countdown clock to the market's closing each day. Whether the market's up (and you're celebrating) or down (and your draining your sorrows), BI and Pernod Ricard have come up with a unique way to make sure high finance types will be reaching for some Regal in 5-4-3-. Nice work.